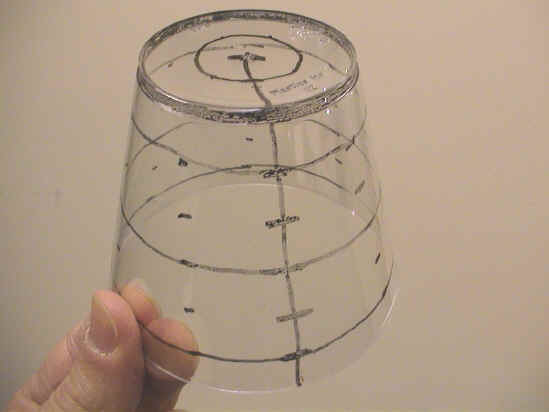 Starlab® operators can use clear plastic drinking cups as miniature clear cylinders. Images drawn on the cups by students can then be projected onto the dome as personal all-sky images and integrated into diverse lesson plans. For good results use black markers on hard, clear, 9 oz. tumblers such as Solo® cups. Though the harder cups tend to crack easily, they are more desirable than the softer, more flexible tumblers, which project a mottled background. 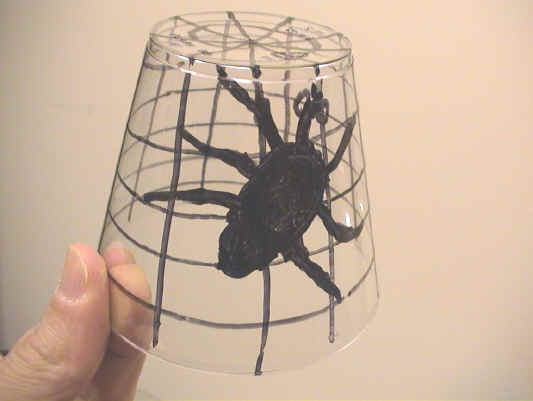 When drawing on the inverted cup, consider how the projected image will appear. With some practice you can compensate for keystoning and other irregularities. Images tend to project larger than expected, too. To draw letters so they are oriented properly, hold the cup upside down. 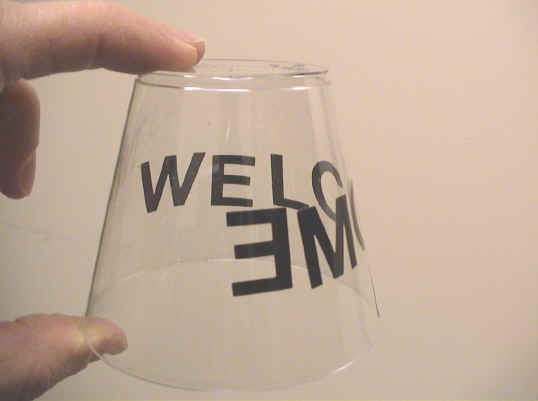 Looking through the closer side of the cup, write on the inside surface that is away from you. If the image contains something in motion, such as a fish, draw it so that it moves to the right (consider the Starlab® diurnal motion). The upside down cup has to be positioned so that the cup's rim is nearly level with the projectors light source. 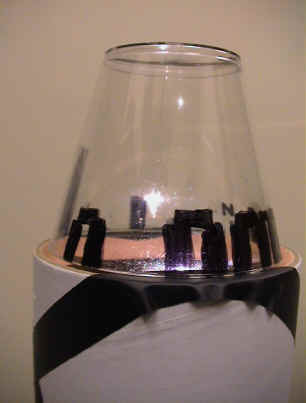 The easiest method is to use the cylindrical lamp protector that is shipped with the Starlab®. 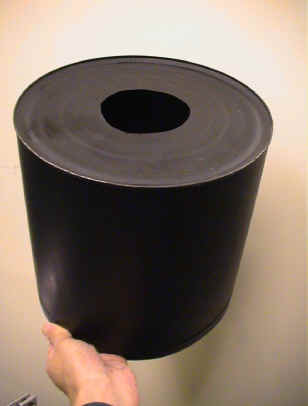 It looks like a mailing tube a few inches in diameter and about five inches long. 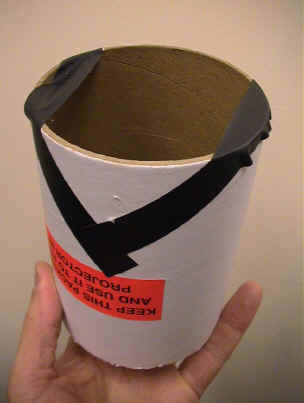 Stick a few pieces of electrical tape tautly across the edges of an end of the tube so that a cup can rest on the non-sticky side of tape without falling into the tube itself. 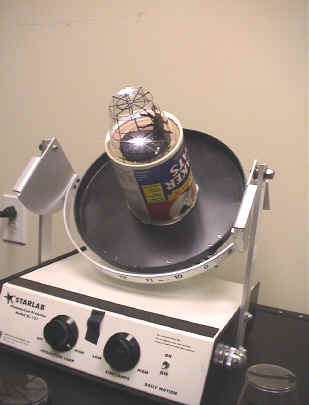 The tape must not span the center of the tube or it will obstruct the light and will itself be projected onto the dome. Position the tube around the lamp holder as it would be while in storage. 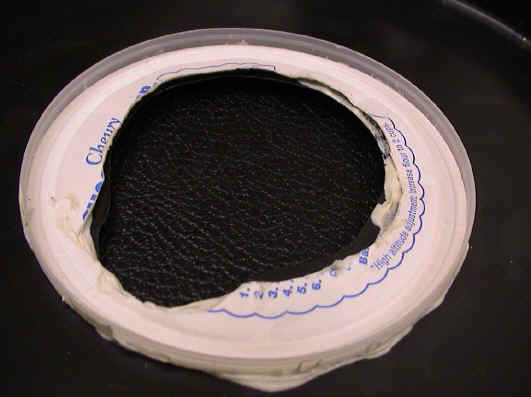 By the way, this ledge of tape can remain permanently affixed to the tube, for it does not interfere with the tube's protective feature during shipping and storage. 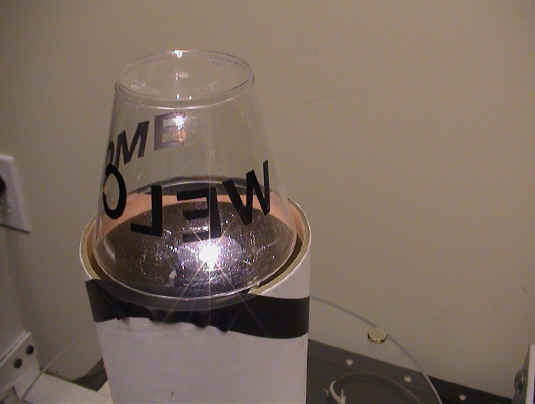 Finally, place the personalized all-sky cup on the tape so it is centered over the lamp. Though applying this device is very quick and very easy, you are limited to level all-sky projections that won't be bumped. 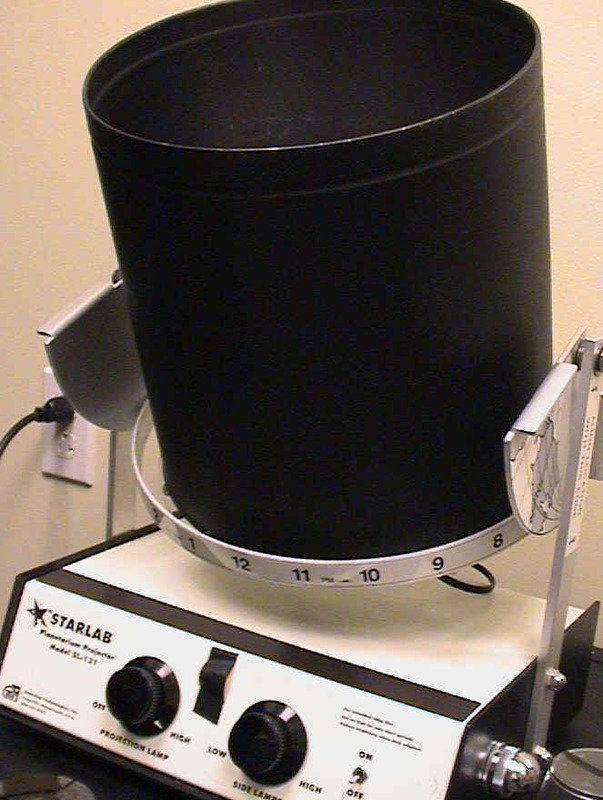 A second cheap method for holding plastic cups requires much less care in balancing the cup and allows the Starlab® operator to switch cups rapidly. It also permits you to incline the cup (akin to tilting the cylinder to a non-equatorial latitude). Conveniently, some metal cans such as those for gourmet popcorn are nearly identical in size to a Starlab® cylinder. Cut a circle out of the cans lid so it will fit over the Starlab® projectors central stalk and over the aligning device for cylinders. Later the upside down lid will lock securely on the magnets. Shorten to about five inches a cylindrical Quaker Oats® oatmeal box. 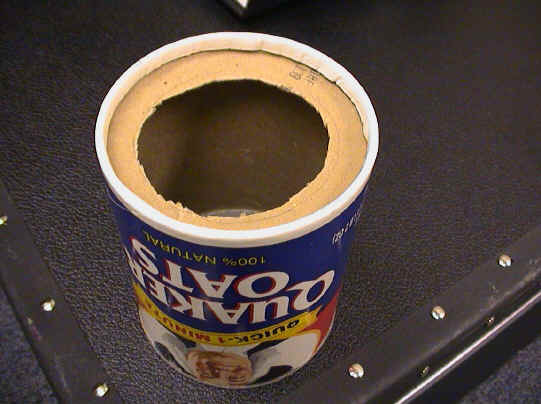 Peel the plastic rim off the top of the cardboard cylinder and re-affix it to the shortened box top. 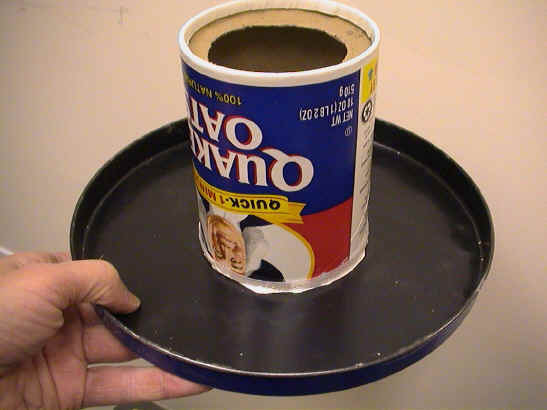 On the bottom of the oatmeal container, cut out a circle just smaller than the diameter of the plastic cup, leaving a cardboard ledge on which a cup can be placed. 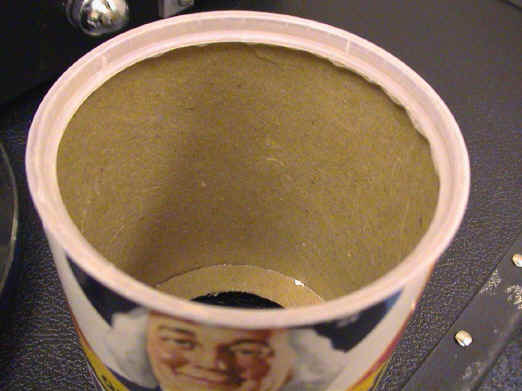 Center the upside down oatmeal container lid over the hole of the upside down popcorn can lid and cut out a similar hole and notch, again to allow the Starlab® stalk to fit through them both. Glue the lids together (I used some leftover bathtub caulk). When in use, the oatmeal box will now remain locked over the center of the platform, yet you can separate them when you want to transport or store them. 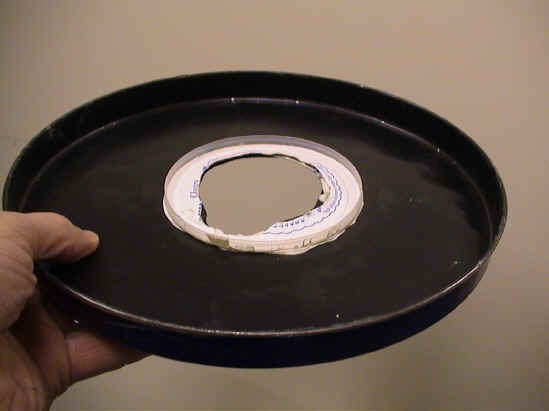 When the glue or caulk dries, paint the entire device flat black if you wish to reduce the amount of reflected light. You are now ready to place the cups with drawings onto the custom cup holder, thereby projecting personalized all-sky images. 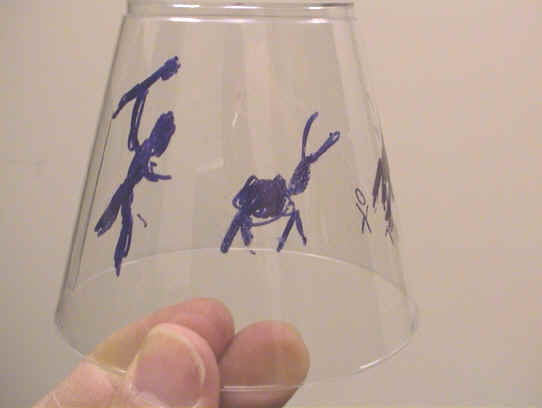 Several cup designs were presented at the portable planetarium session of the 1997 GLPA Conference. Among the all-sky scenes were the insides of an igloo and an observatory; a sky full of bats; the horizon at Stonehenge; an underwater scene; a GLPA Conference welcome; and a spider in its huge web. Another design mimics a petroglyph of a hunter pursuing some prey. Before entering the dome, young students can be prepared for an expedition into a cave. With their imaginary headlamps illuminating the way, they crawl into the Starlab® tunnel and discover the cave art on the inside wall. There are unlimited scenes that can be projected onto the inside of a dome to support a wide range of disciplines and lesson plans. Student drawings can dovetail with or diverge from the instructor's drawings on a Starlab® clear cylinder. Keep the metal popcorn can with a hold cut in its base for other uses. 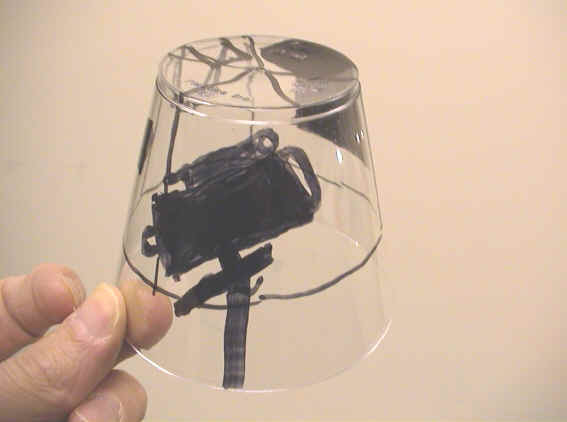 For example, secure a piece of plexiglass over the top to make a circular overhead projector in the Starlab®. Or come up with your own applications and submit them to the Paper Plate Education collection. See Constellation Projector for related applications. GLPA Proceedings, 1997, p. 147.